3M™ Tape Primer 94 can be used to promote adhesion of 3M™ tapes to surfaces such polyethylene, polypropylene, ABS, PET/PBT blends, concrete, wood, glass, metal and painted metal surfaces. This primer needs to be applied to clean and dry surface, contaminated surfaces should be cleaned with a 50/50 Isopropyl Alcohol and water mixture. Our MBS 1943 Surface Preperation Wipes are ideal for this task. Once applied, allow to dry (usually takes 5 minutes at room temperature). 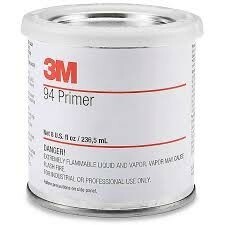 Porous surfaces may require 2 applications of 3M Primer 94 for uniform coverage and good adhesion. © Multibond Solutions Limited. All Rights Reserved.